← What Will Major Cities Look Like in 25 Years? Just think about that headline for a second… 85 people have as much wealth as 3.5 billion people. Eighty-five vs. Three and a half billion. Maybe looking at the words isn’t enough, let’s look at it in numbers. 85 vs. 3,500,000,000. If I were graphically inclined, I’d make a quick “infographic” showing 85 people on one side and 3,500,000,00 on the other side. That’s an astronomical difference. The world’s wealthiest people aren’t known for travelling by bus, but if they fancied a change of scene then the richest 85 people on the globe could squeeze onto a single double-decker. This isn’t the first time I’ve written about wealth inequality and it probably won’t be the last. There are two posts that come immediately to mind. The first is the one from a couple of years ago where I shared a graphic that came from a paper by two researchers studying the wealth distribution in the US. Most notably from the graphic was that the perception of American was way off from reality. Americans thought that the top 20% had approximately 60% of the wealth and they wanted the distribution to be that the top 20% was closer to 30%. In actuality, the top 20% (at the time) had close to 90% of all wealth in the US. The second post was just under a year ago and it took a deeper look at the graphic that I shared in the first post. Someone animated the chart, that is to say, they made a video of the information to make it more accessible to people and it was shared heartily across the internet — it’s currently over 14,000,000 views. So what does all of that have to do with today’s information? Well, as is pointed out in the article in The Guardian, the World Economic Forum is starting in a few days, so talking about these kinds of issues are important. That is, reminding folks that the people in attendance at Davos will make up well over half of the wealth in the entire world. The image I’ve used for this post comes from that same article and it’s how I’d like to finish today’s post. Take a look at the United States. 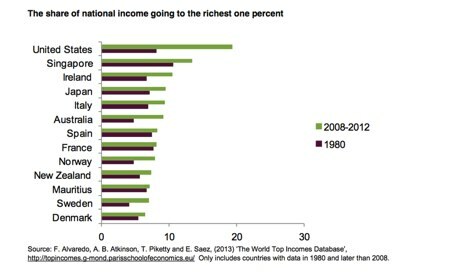 In 1980, the top 1%’s share of the national income was 10%. In 20 years, that’s doubled to 20% (of the national income). There’s been movement in other countries, but none as great as the US. I’m not picking on the US, but it’s quite clear that if you’re interested in being part of the wealthiest sect of the world, the US is a good place to do just that. My point in sharing this image is to forward the conversation on this matter. People have very different opinions on how money should be spent, especially when that money is tax dollars. I’m not necessarily trying to trumpet one opinion more than the other, but I think it’s important to highlight this massive disparity and question whether this is how we want to live in the world. This entry was posted in Business, News, Philosophy, Politics and tagged Davos, Economic inequality, Income Inequality, Inequality, Perspective, The Guardian, Wealth, Wealth Inequality, World Economic Forum. Bookmark the permalink.